Conny Torstensson is former Swedish midfielder. He was talented player but lacked consistency, and Tostensson was actually similar as Boniek playing the best in the European Cups and scoring many important goals. He played mainly on the right midfield side, had solid pace and good passing. Especially dangerous were his through balls for Gerd Muller. Conny had good shot, strong and quite precise but he didn't score too many goals. Not too strong in physical play, had solid leap and dribbling. He began in 1967 in ' Åtvidabergs FF (at the time with one of the best addresses the youth sectors of Sweden) immediately winning promotion to the Allsvenskan. The years after the epic was one of the columns of gold with which the team won, between 1970 and 1973 , the only titles in the formation of Åtvidaberg, winning four consecutive titles, the first two national cups (1970-71, more lost the final in 1973) and two editions of the Allsvenskan (1972-73, after two consecutive second places). At that time he was teammate of two other strikers in the Swedish seventies, Roland Sandberg and Ralf Edström , who, like Torstensson left Sweden in the 1973-74 season, respectively, to arrive at Kaiserslautern and PSV Einhdoven. In years 1970/71 and 1971/72 the Åtvidabergs FF participated in his first two (and only) edition of the Cup Winners' Cup since winning the Cup in Sweden. After eliminating the preliminary round in the first edition, in 1972 the Åtvidabergs came up to the quarter-finals after eliminating the holders of the trophy Chelsea. Two years after the Swedish team made ​​its debut at the top of European football in the first round of the Champions League 1973-1974 the FF Åtvidabergs met Bayern Monaco , the star champion of Germany, fielding champions as Hoeness, Beckenbauer , Breitner, G. Maier and Müller, the Bavarians were among the favorites of the tournament. After a 1-3 defeat in Germany, the Åtvidabergs FF won by the same score in Sweden, with two goals from Torstensson, whose fear of the Germans went 3-0 before goals from Hoeness after 3 minutes, ended goalless extra time The game was decided on penalties, where the Germans sprang 4-3, avoiding a sensational elimination against the Swedes surprising. During the two-match Torstensson impressed staff and management of Bayern, who bought it shortly after Åtvidabergs for the considerable sum of 580,000 marks. Since the 1973-74 season as a starter Torstensson participated immovable cycle that saw the German team graduated three consecutive European Champions (playing as a starter the first 2) and a champion of the world (besides the title '73 / '74 ) Torstensson, compatriot Bjorn Andersson and Danish Johnny Hansen were the only non-German holders of Bayern at the time. In 2011 Torstennson holds the record for Cup / Champions League is awarded to a Swedish footballer playing in the final both being part of the winning team. Torstennson played until 1977 in 81 matches of the Bundesliga scoring 11 goals, as well as 4 goals in 12 appearances in the Cup of Germany with the top of his contribution was more significant in the Bavarian Cup Champions, where he scored many important goals (10 in 21 appearances total). In 1973 in particular (the year started with the shirt dell'Åtvidabergs) scored twice in the going of the quarter against CSKA Sofia (4-1 in the decisive result since the return of the 1-2) and a goal in both rounds of semifinals (1-1, 3-0 against the ' Újpest Dózsa ). At the end of the tournament Contiental Swedish result was the vicecapocannoniere (ex aequo with Raoul Lambert ) with 6 goals, 2 in less than teammate Gerd Muller. In the following two editions each scored one goal: to remember the network in the second round of 1976, decisive for the passage of the ballot, the compatriots of Bayern's 2-0 Malmo FF (victorious 1-0 in Sweden ). Participation in the latest (1977) scored 4 goals, tied for second resulting from the gunners of that edition (again behind Muller and Cucinotta ). After a spell in Switzerland at Zurich, Torstensson returned to his home club, the Åtvidabergs, which ended his career in 1980 , at age 31. He began the National in 1972 : from there until 1979 he played forty games scoring seven goals, participating in the editions 1974 and 1978 of the World . 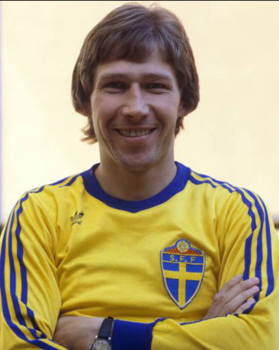 In particular the Swedes in 1974 helped to overcome the first round group matches, and scored his only goal in the third global meeting of the second group stage against Yugoslavia (with both teams already out of contention for the finals). The German World was a great result for Sweden, which has long got no satisfaction at the international level: global markers were just the 3 former Åtvidaberg: Edstrom (4 networks), Sandberg (2) and as mentioned Torstennson. Start the first game of the round, he jumped the second and third took over, only to recover the starting spot for the remaining 3 games of the semifinal round. The 1978 edition was instead very negative Torstensson, both as a team (Sweden finished last in the group with 1 point) and individual (one to be taken over there). It's RF/BS actually. He also used to play in the left wing, in particular when Kapellmann was on the field in the right side.